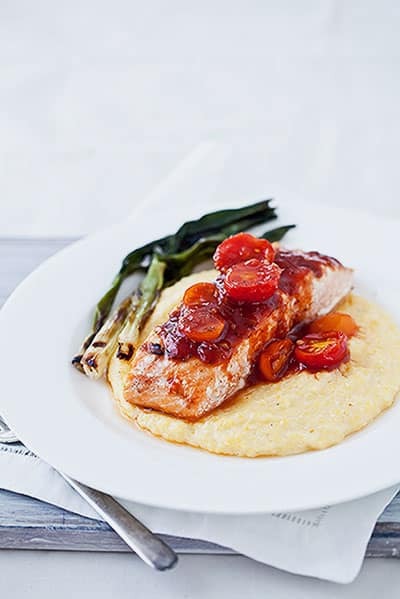 Super fresh fish, garden-fresh tomatoes from the heart of the summer veggie crop, and toothsome, stone ground grits provide a gorgeous backdrop for a sauce prepared with equal parts Original and Spicy Slather Brand Slatherin’ Sauces. If you want to step up or step down the heat, go with 100% of each in this truly luscious and easy to prepare recipe. If you can’t find beautiful, fresh fish, substitute another mild, meaty variety such as grouper, sole, flounder or cod. This entire meal comes together easily in less than 30 minutes. Meanwhile, light or heat your grill to medium high. You’re shooting for the three second rule with the heat. That is to say, when you hold your hand near the hottest part of the grill, it will take about 3 seconds before it’s uncomfortably hot. Brush both sides of each filet generously with the 1/4 cup Original Slather Brand Slatherin’ Sauce. Season both sides generously with salt and pepper. Toss the scallions in a small bowl with olive oil, salt and pepper. Arrange the glazed fish on the hot grill over the hottest part of the grill. Arrange the scallions off to the side on a slightly cooler part of the grill. Grill, covered, for about three minutes. Turn each filet and toss the onions. Continue cooking for another 2 – 3 minutes or until the fish is just opaque in the center. Remove from the grill, cover lightly with aluminum foil and set aside, briefly. (Note: The fish and onions can also be broiled in the oven under a hot broiler). Prepare the sauce by combining the two sauces with the tomatoes in a small saucepan. Bring up to a simmer over medium high heat and cook through for 5 minutes to heat through. To plate, arrange a generous portion of the warm grits on a plate or a shallow bowl. Top with a few grilled onions and a filet. Spoon a couple tablespoons of the warm sauce and tomatoes over the top. Serve immediately. Delicious!